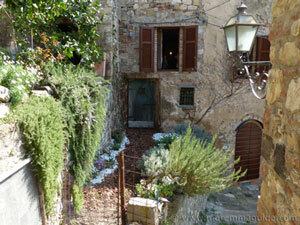 Let me lead you by the hand to really romantic accommodation in Tuscany Italy, in a stunning setting in Maremma. 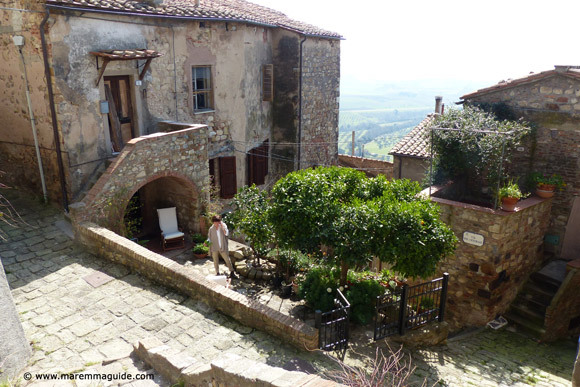 There are a lot of places to stay in Tuscany that can more than justifiably be called romantic: after all Tuscany is romance and many rental apartments and villas are centuries old, set in stunning rural and city settings. So you won't have a hard time finding something that will fit the bill. But I'm not going to list them all here. I'm just going to tell you about one place. 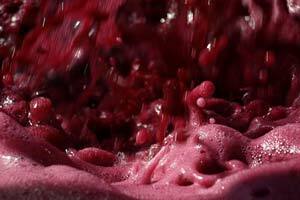 Because sometimes, the magic that is in the air in Italy takes a womans hand and leads her to create something that was destined to be. Something that, when she has finished, speaks of romance. Not because she set out to do so, but because the buildings and the walls tell it so. OK. Note of propriety, it can be a man's hand too... but my fingers didn't type that! Because the panoramic view for miles across the river plain below the castle walls from the matrimonial bedroom in the tower apartment, with swallows swooping past, and the spring light and warmth streaming in, will fill you with happiness. When I stood in the bedroom of the apartment awaiting restoration - home still to some memorabilia of the old lady who lived there - and opened the window onto a heart swelling view below, I was moved to tears. For I felt such a strong sense of the joy of young newly-wed love and the years that passed into old age. Still sharing the same bed together and opening every morning that window onto an incredible view. View from Montemassi's castle that dates to the year 1000. 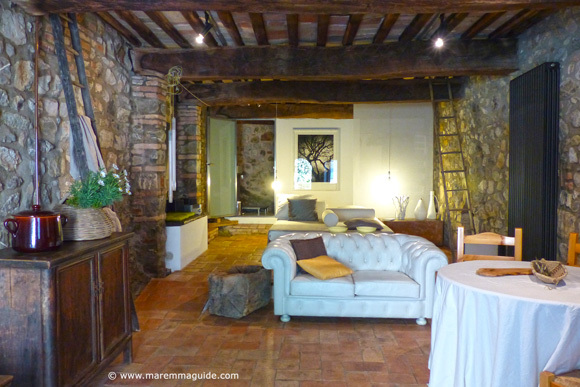 Because the magic in Montemassi - no doubt mixed with a great deal of negotiating ;) - has unbound three medieval buildings - one on top of the other - to become the property of one lady, and become one. 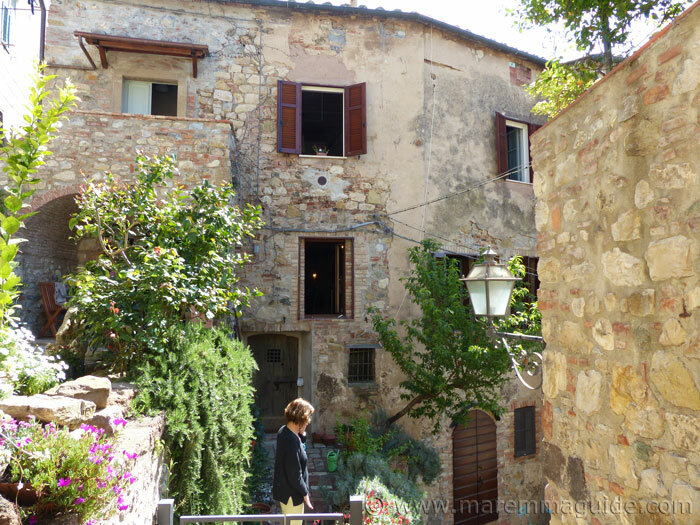 Because the apartment awaiting restoration and that which has already been lovingly restored, are situated within the fortified city walls of the historic heart of medieval Montemassi. Alongside what was once the main city gate, through which knights on horse back would have entered and passed by the front doors under the gaze of Montemassi's medieval castle above. Because the apartments hold so many stories waiting to be told. 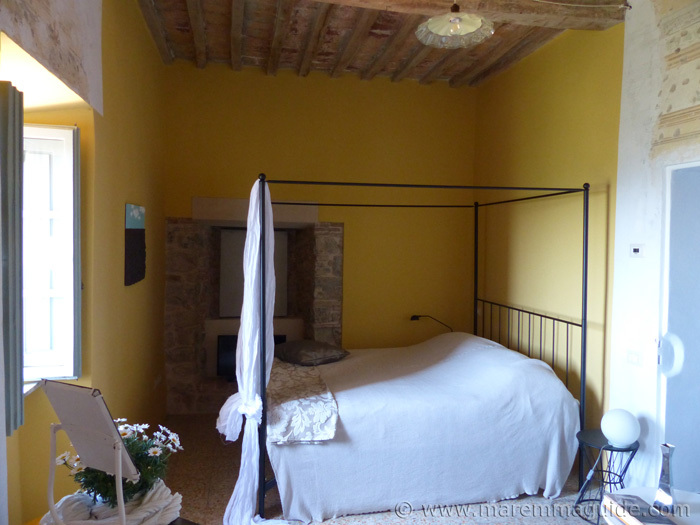 The rooms of the old lady, Maria, who lived in the apartment upstairs have a French feel to them: France in rural Maremma! And she too wasn't typical: for she read a lot. Lots and lots of books. Not cheap novels, but literature. And because during the first initial days of restoration, beneath the whitewashed walls, a fresco has been discovered. 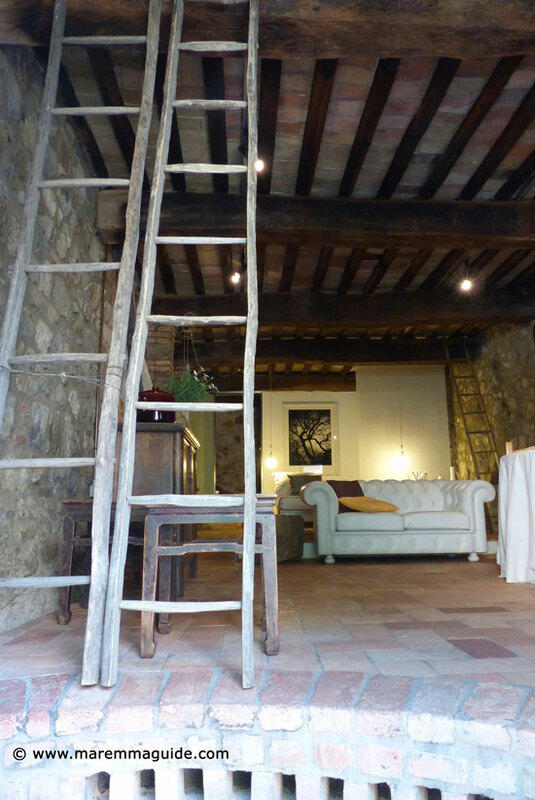 Gabriella's apartments are more romantic than any accommodation deliberately set out and decorated to be. But you don't have to be a dreamy romantic to be in love here. It is a place of incredible panoramic views, space, and silence. If you are a photographer or artist, then the setting of Via di Corte will have you smiling like a Cheshire cat; you cannot turn an inch in this once medieval castled city without being presented with an image that just has to be captured. As for history lovers, you only have to touch the beams, the stones of the fortified tower, sit in the castle, or walk up and down the twisting steep medieval alleyways, to be in heaven. And all the while there is nothing but silence. In this cluster of old homes cats sleep, and the radio gently playing in the apartment opposite, goes silent at 3pm when the old sisters who live there take their afternoon nap. 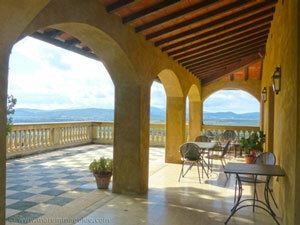 This is rural Tuscany atop a famous castled hill with a view that will fill your dreams. Unless, as I read somewhere the other day, "you might not dream, because you are already in one". 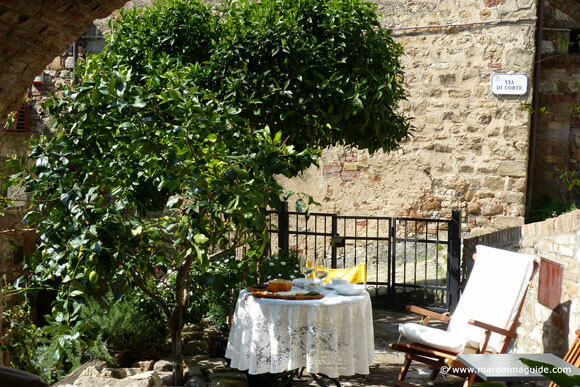 The apartments of Via di Corte that Gabriella has lovingly restored - each with their own individual style and character - are one of the rare places that, when you arrive, are more than you expected. And when you open the front door for the first time, make you stop in your tracks and stare. It is the details that an inquiring eye will notice. 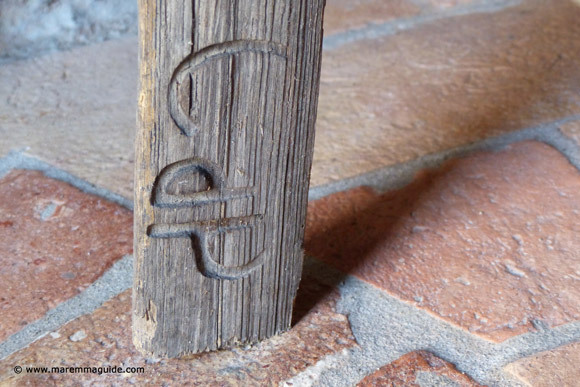 Such as the relief carved initials of the artisan that made them on the original hand-made wooden ladders in the apartments. 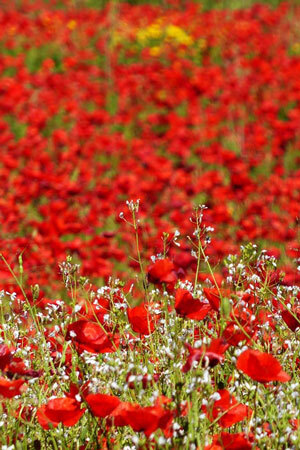 Or the swathes of handmade fabrics that she loves and swaps around when the will takes her. 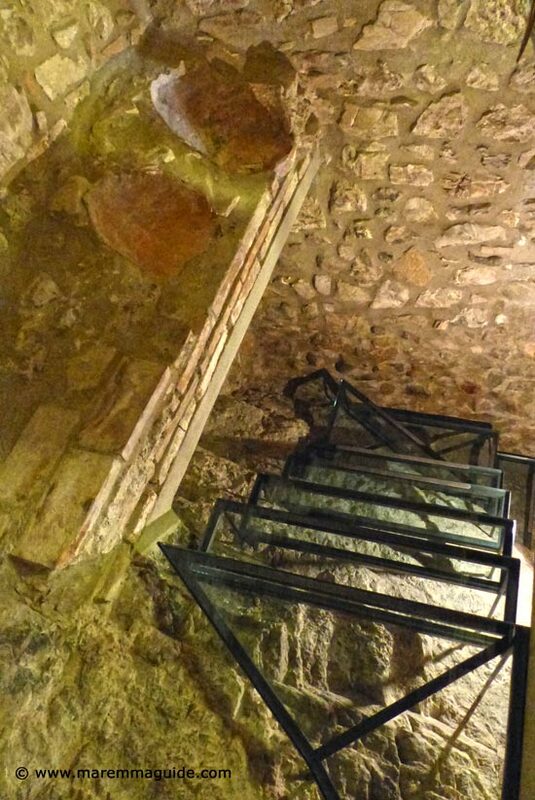 A glass panel in the stone floor that enables you too see to the level below. 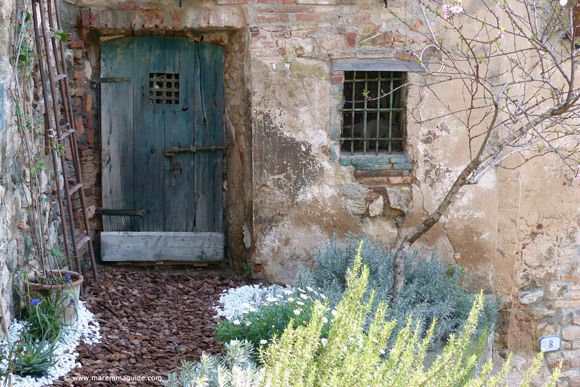 And old Tuscan doors, saved, and now sculptures in their own right. Gabriella's bed and breakfast studio apartment is located on the ground floor of her three different levels, adjacent to the old city's main entrance gateway. Her home is on the level above, and the larger apartment she has also restored is on the top floor. 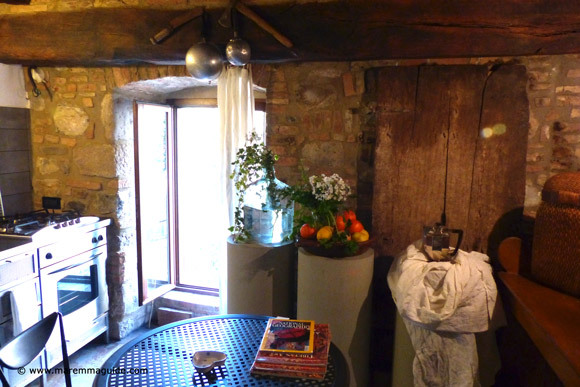 The B&B has its own arched front door, an open-plan kitchenette and dining area, sofa, double bed, and en-suite bathroom. 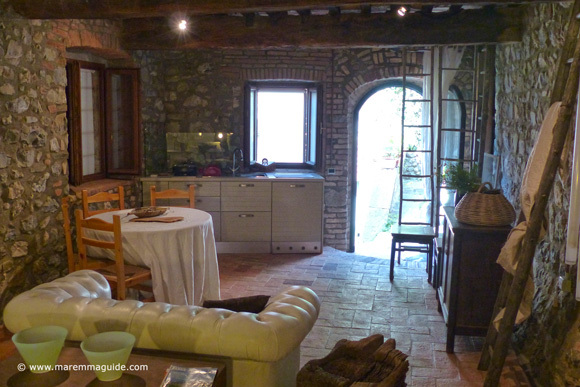 Perfect for two planning a romantic Tuscany break or getaway together. An extra bed for a child can be provided. 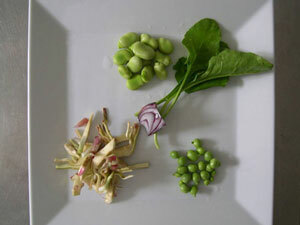 And with the kitchen, mum can cook-up something when needed. You won't have to eat out every day if you don't want to. 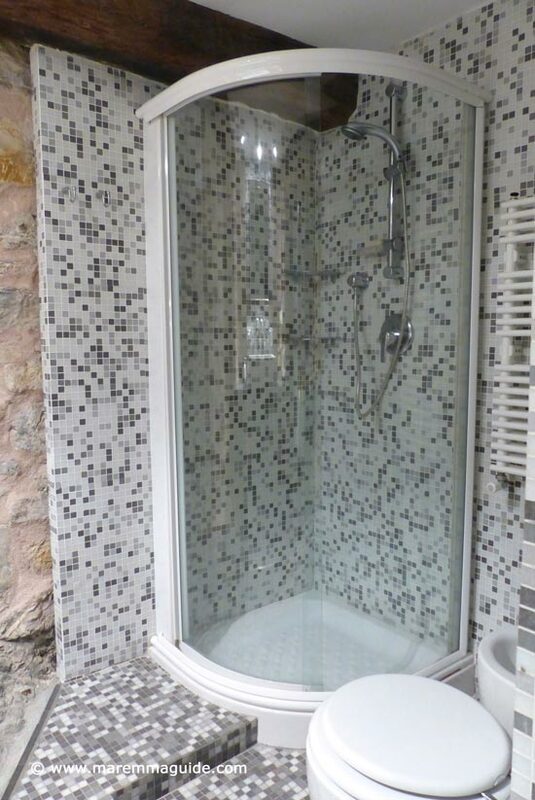 The bathroom is small, but stylishly fitted-out. 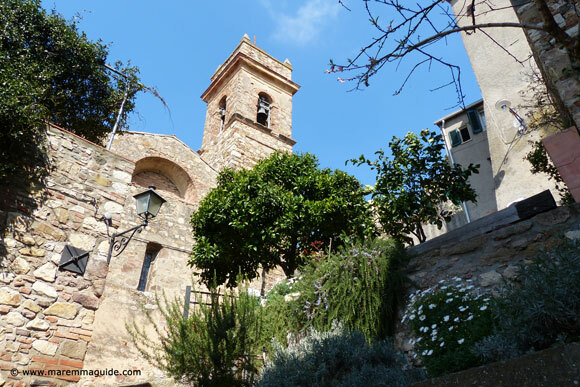 The view from the B&B front door to the rear of the ancient castle church - first records date back to 1076 - "la chiesa di Sant'Andrea Apostolo" (the church of the Apostle Saint Andrea). 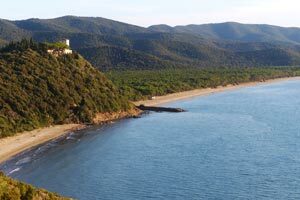 And if an aperitivo and a chilled bottle of Prosecco waiting for you each evening when you arrive back after exploring Maremma is your kind of dream. She will happily arrange that for you too. 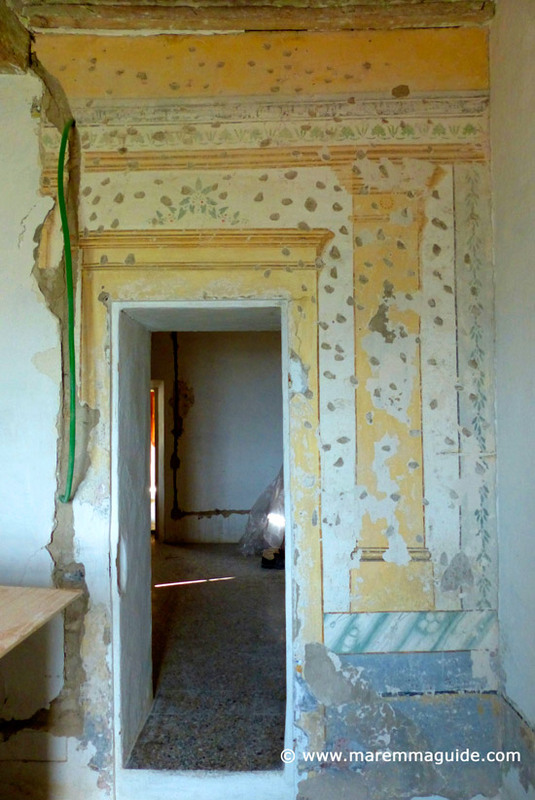 In the B&B apartment there is an album of images that Gabriella took during the restoration, so that you can see for yourself what she found along the way and the centuries of dust! The bed and breakfast apartment is connected via an internal door and wrought-iron and glass stairway to Gabriella's home above. The internal door is locked when the apartment is occupied, but alternatively makes for an additional self-contained extension to Gabriella's own apartment which, with sufficient notice, can be rented too. 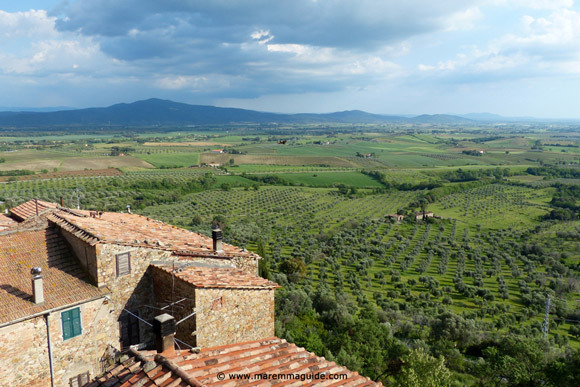 Ideal if there are more than two of you planning a romantic vacation to Tuscany together. One of the particular delights of this apartment are the ever changing levels that captivate your eye wherever you turn. Built as it is on and around the hillside and its bedrock. 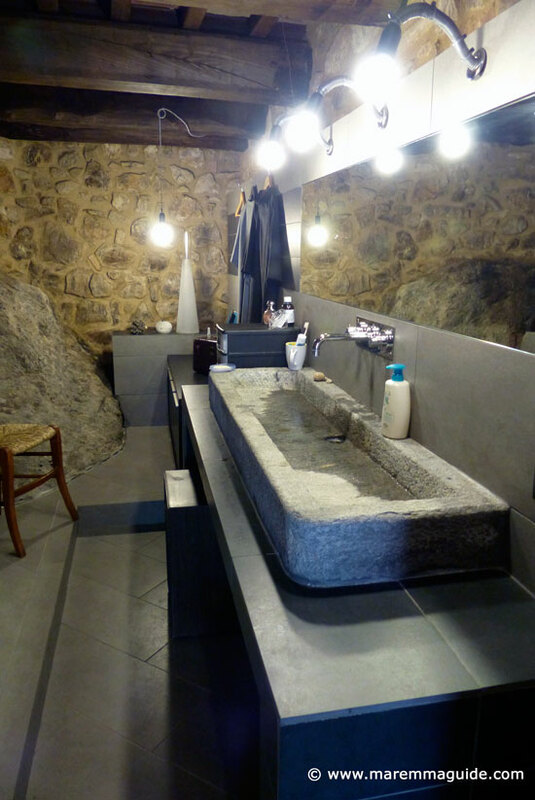 The stone floor of the long internal hallway that leads to the bathroom and opens into the kitchen and dining room, has been cleverly thought through and built suspended above the bedrock of Montemassi with air flow channels beneath it. Even in the depths of winter when it is pouring down bucket loads outside, you won't feel any cloying damp in this house. 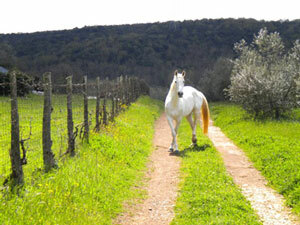 It follows the path of an ancient medieval road through Montemassi! The steep stepped one that passes in front of her house is the "new" road through town, only 300 years old! The simple long table set by the window in the living room is a perfect setting for writing a journal, or contemplating you digital photos of the day on your iPad. A window onto a unique world that you will be hard-pressed to leave. The old arched and towered gateway in Via del Ceneraio is blackened because of a fire. "Cenere" in Italian means ash. It is where the local charcoal burner once lived. 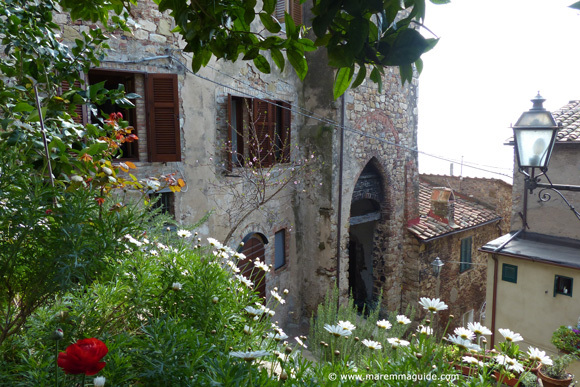 When Gabriella took the apartment back to its basic structure she found in her home not just the bedrock on which the town of Montemassi is built, but the castle wall, an Etruscan wall, and ceramic pots set in stone. The two depressions cemented in the walls - not by Gabriella - but found that way during excavations of the apartment - are the bases of ceramic pots. 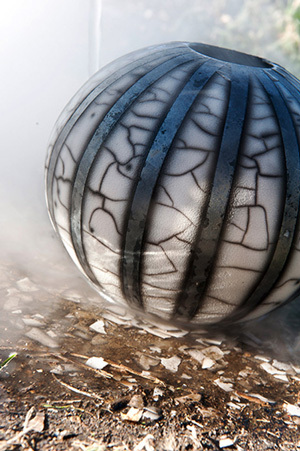 Archaeologists from Siena University believe that this room was originally where ceramic pots and vessels were made. She invited the archaeology department of Siena University in to explore more, and they subsequently dated the layers in her floor back to the Etruscan period. 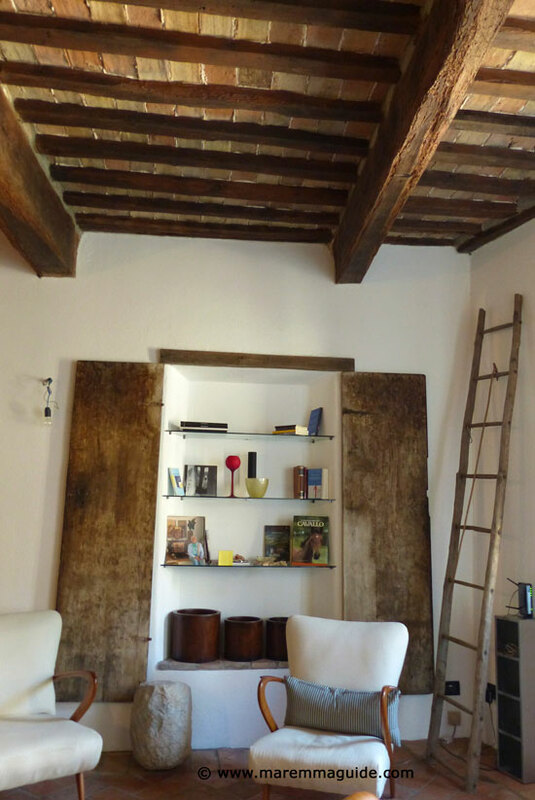 Nearly all of the huge wooden supporting ceiling beams are original. 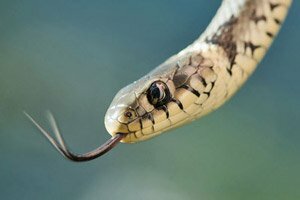 One is seven metres long and has a smooth part on one of its sides that just begs to be stroked, just as many hands must have done so over the centuries when they ducked under or passed by. 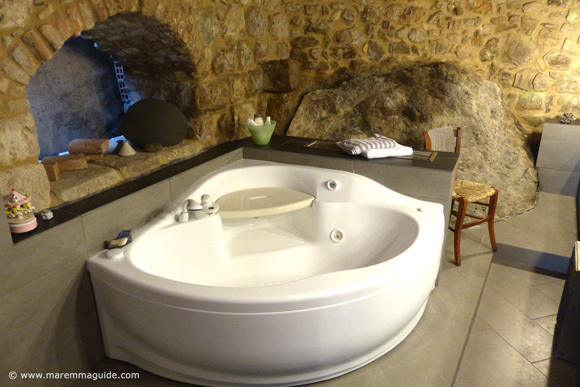 The bedrock emerges in the bathroom like a permanent house guest. 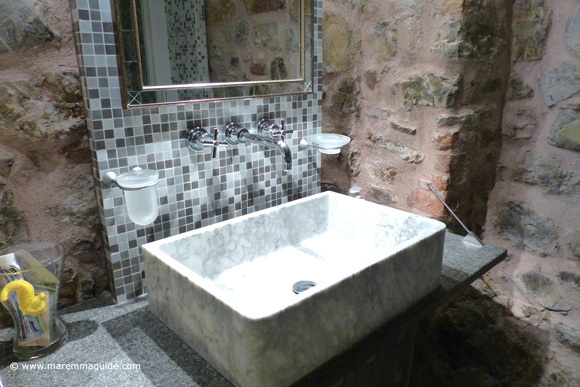 The arch opens onto the foundations of the castle walls, and the long stone sink is fifteenth century! 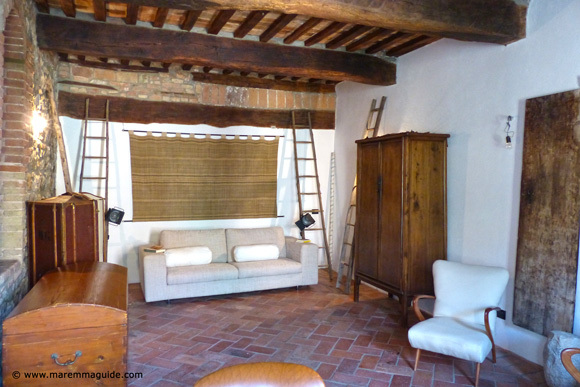 The top floor apartment is full of light: when the shutters are opened it just floods in bringing with it vistas of terracotta roof tops, of tiny courtyards and gardens below, of dark arched alleyways, of the walls of a castle keep and its church. 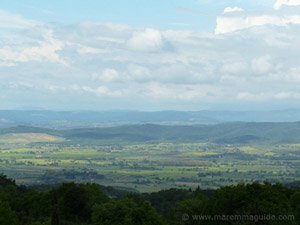 And stunning Maremma countryside, woodlands, olive groves and vineyards just asking to be explored. Just part of the view from the bedroom window. It was built on top of Gabriella's home and over the arched gateway in the late medieval period/early Renaissance period. 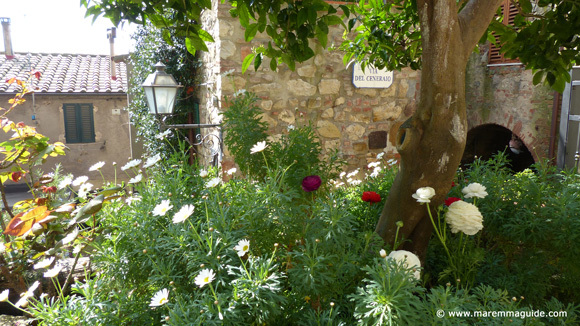 Re-using, as everyone did in Maremma's castled hills in those days, the stones of the original castle. Gabriella already knows that this apartment will be decorated differently from the other two. It feels different. 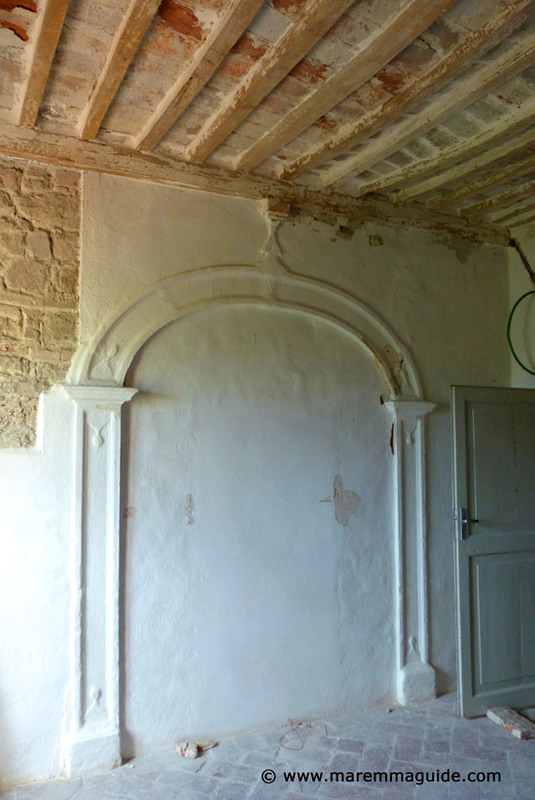 There are arches and architraves inside to be uncovered, false ceilings to be removed, old doorways to be revealed and new ones made to make way for a spacious second bathroom. There is already a studio living area - an ante room to the double bedroom - perfect for a day bed for dreamy days reading and sketching. And ideal for a couple of children to sleep in too. When Via di Corte is finished, this apartment will be a very special and spacious home indeed - it is 100 m². 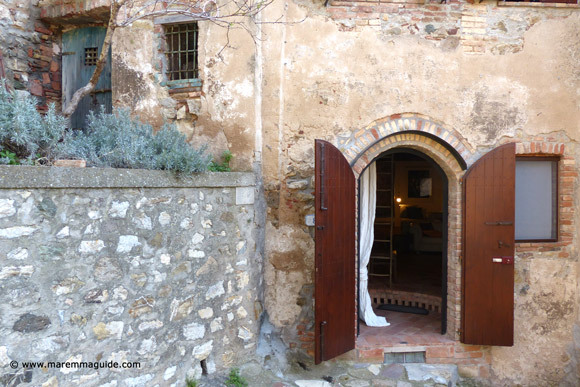 Not many romantic retreats in Tuscany have rooms that extend into the top of an ancient arched "porta" into a medieval city. 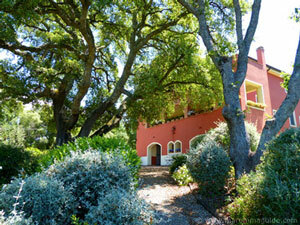 It will be perfect for anyone looking for a quite honeymoon location after a romantic Tuscany wedding. 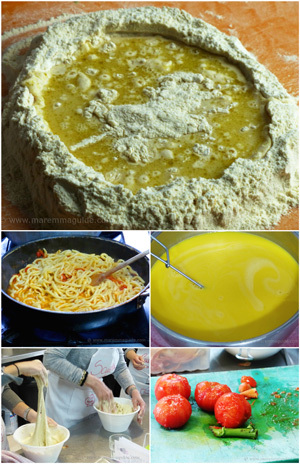 Or a dad looking to take his family on holiday to Tuscany and give his wife a romantic treat that she will love. HINT mum's, put him out of his misery trying to decide where to book to surprise you and show him this page! I have already told Gabriella that if I win the lottery I will want to buy this apartment! A week after I took these photographs Gabriella emailed me to tell me that the initial restoration work had started, but that she had had to stop it! In what she calls the room with the Van Gogh's window on the valley, some wall paintings had appeared under many many layers of paint and that they were probably thirteenth or fourteenth century! She doesn't know if they can be recovered, but is consulting a professional conservator to see what can be done within her budget to ..."preserve this little piece of story of the house! 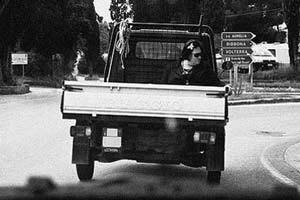 I am excited, it is not only restoring: it is a trip back in history: che bello." I went back and took some pictures. And this the arch - only half of it was visible before - that it is now clear connected two large and important rooms. Gabriellla has had it opened again so that now the main double bedroom is connected to its own private living room. Both with a stupendous view. 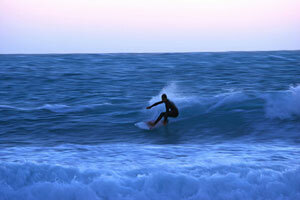 All the way to the sea. To the Island of Giglio. And, on a clear day, to Corsica. And then restoration had to stop again for some serious structural support. Because it was discovered that, although the outer walls had been standing since the late medieval period/early Renaissance, they were structurally unsound! And. This part is going to tickle you pink. The wall was occupied by an enormous and very active bee hive. Whose honey - all 70 kilos of it - was literally holding the wall together. Specialists had to be called in to remove the hive and its bees, the honey, and rebuild the wall. These rooms with a view in Italy that dreams are made of, are now ready for you to stay in them. Very stylish rooms. Different from both her home and Il Fondo downstairs. Gabriella still keeps adding a touch of her distinctive style here and there. She likes to drape her fine linen finds over a chair or bed for a few weeks to see if it really does fit in the room. Considering every "dettaglio" (detail) until she is satisfied. And then changing them again like a change of scene at an opera. When you meet her and find out what she does for a living, you will understand that it is in her blood to do so! Around the corner, Gabriella has started to resurrect an old medieval garden that was the garden of the resident armies of the castle but which is now a wild wood. 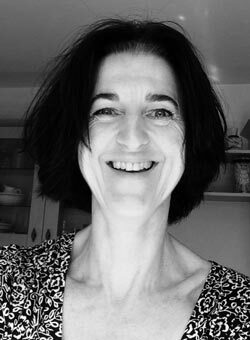 With tuition on reviving the ancient fruit trees in it and having brought new ones, she is setting about trying to bring-it back to its former self. She is not sure that she will succeed, but describes the whole experience as an adventure. And it is. I'll add some photos of this too the next time I visit. 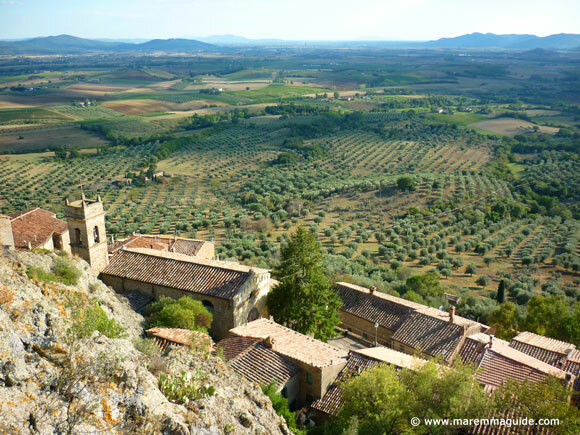 Gabriella will shortly be organising for her guests treks in the wonderful metalliferous hills surrounding Montemassi, and wine tasting tours. Watch this space, or ask her when you contact her below. Now I know that this won't put you off a bit, but be aware that the closest place that you can park your car is a two minute walk away - down or uphill, whichever way you are going. To check on availability and for further information, send Gabriella an email via the form below. 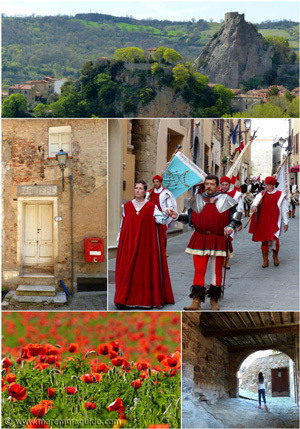 Read more about the town of Montemassi and its castle.